We know that our society is not color-blind, nor is it blind to LGBTQ identities. As evidenced by the historical success of the Voting Rights Act, we need laws that are equipped to address the particular obstacles that disadvantaged groups face. The Voting Rights Act was signed into law 50 years ago to rectify a “clear and simple wrong.” Throughout the Jim Crow South, African Americans were systematically denied their right to vote through tactics like literacy tests and poll taxes. The Voting Rights Act (VRA) outlawed these and other targeted voting restrictions. It also sought to prevent future violations in particularly problematic regions of the country through Section 5 of the act, which requires certain jurisdictions with a history of discrimination to submit any proposed changes in voting procedures for “pre-clearance” by the federal government. This pre-clearance safeguard has allowed the Department of Justice to block discriminatory changes to voting laws over 700 times between 1982 and 2006. Unfortunately, this pre-clearance protection was dismantled by the U.S. Supreme Court in 2013, just a day before the Court also struck down the Defense of Marriage Act (DOMA). While Section 5 was technically left untouched, with Chief Justice Roberts writing for the majority the Court ruled that Section 4(b) of the VRA, which determined which jurisdictions would be subject to pre-clearance, was unconstitutional because it relied upon formulas that were out of date. The effect of this ruling essentially stripped the federal government of its ability to block discriminatory voting laws in those places until a new formula is established. Underlying this attack against the Voting Rights Act and other critical civil rights law is the theory that our Constitution generally requires our laws to be “colorblind” and treat citizens the same regardless of racial differences. While such an approach may appear to be an effective way to achieve racial equality, it is ultimately self-defeating. In a society that is built on structural inequalities based upon race, treating people the same regardless of their race only perpetuates existing inequalities and outcomes. That cannot be the promise of our Constitution. Since the ruling two years ago, many states have been able to pass more restrictive voting laws, including: gerrymandering districts with high proportions of minority voters, changing polling places with little notice, implementation of mandatory photo ID requirements, disqualification of registration based on a recent move, and reducing or eliminating early or absentee voting. While these restrictions may not appear as “clear and simple” a wrong as those from the 1960s, they have the same effect of disenfranchising people of color. For example, eliminating or reducing same-day registration, absentee voting, and early voting makes voting more difficult for people of color, who are disproportionately in lower wage jobs with inflexible job schedules. Photo ID requirements also have a greater impact on people of color, who are less likely to possess the necessary documents. Voter ID laws are also troubling for the LGBTQ community, beyond the challenges they pose to LGBTQ people of color. In most states it is incredibly difficult if not impossible for trans people to change their state-issued IDs to reflect their gender identity, a name change, or a photo that reflects their gender expression. Even if a trans person registers to vote with a valid ID that does not reflect their identity or expression, and presents the same ID as the law requires at the polls, they may be subject to extra scrutiny based on their appearance. Furthermore, trans people are subject to high rates of unemployment, poverty, and homelessness, all of which may create barriers to them getting identification in the first place. To fight the disturbing loss of voter rights across the country, Congressional Democrats introduced The Voting Rights Advancement Act (H.R. 2867/S.1659) (VRAA). 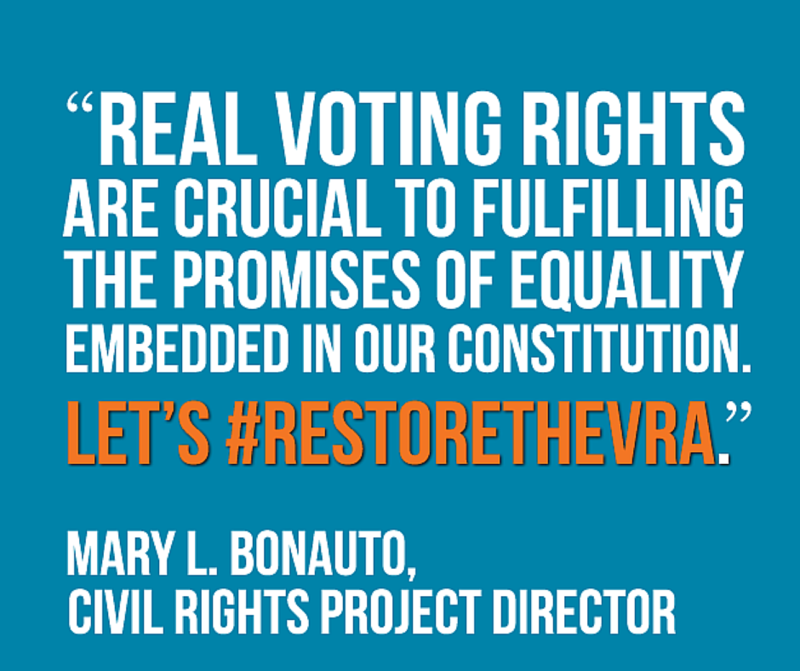 The VRAA seeks to create new tools to protect vulnerable voters nationwide. The VRAA would address the 2013 ruling by modernizing the pre-clearance formula that identifies states with patterns of discrimination. It would also require that all jurisdictions provide public notice of all changes to voting laws at least 180 days before an election, protect against changes to voting laws that are most likely to impact communities of color, empower federal courts to order a pre-clearance if necessary, bolsters the federal observer program, and greatly expands voting rights access and protections for Native Americans and Alaska Natives. We know that our society is not color-blind, nor is it blind to LGBTQ identities. As evidenced by the historical success of the Voting Rights Act, we need laws that are equipped to address the particular obstacles that disadvantaged groups face. That is why formal equality in the law is not enough to lift our communities up to a level playing field, so that we can all enjoy equal opportunities. We deserve a fully restored Voting Rights Act that grants us positive rights to ease access to registration and the polls, and allows all citizens to exercise their civic duty. That is the promise of our Constitution, and that is the hope for our democracy.